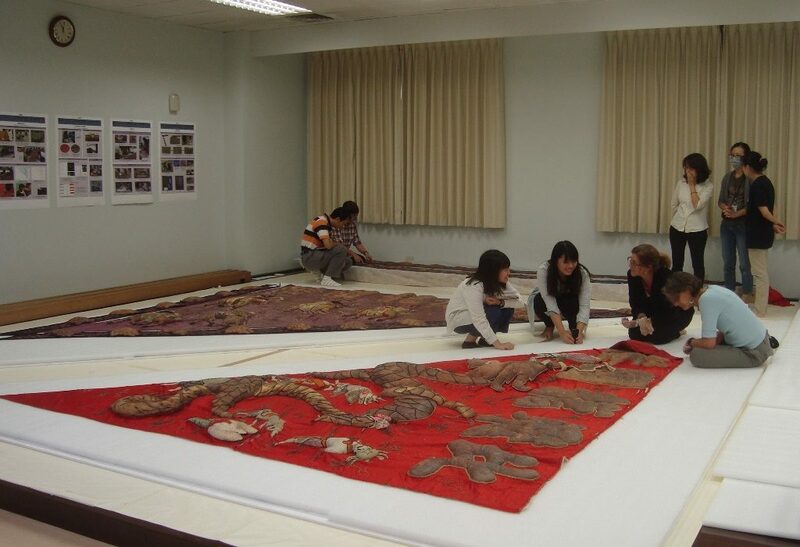 I’ve just returned from the city of Tainan in Taiwan where I was invited to visit the Institute of Cultural Heritage Preservation Research, part of the Ministry of Culture’s Bureau of Cultural Heritage, to discuss the treatment of two dragon banners. The banners are very significant cultural objects, unique in Taiwan. 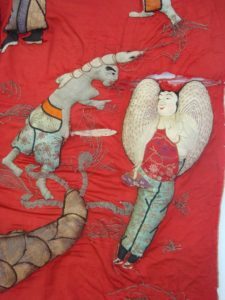 They were made in 1926 for a folk religion dance group in Yunlin County and were used for 60 years during the festival of Matsu, the Sea Goddess, when they were paraded through the streets from the temple. They were last used in 1985. The banners are wonderfully decorated with heavy embroidery. On the front, red side, a dragon chases the flaming pearl of wisdom surrounded by sea-life figures from popular culture, while on the reverse, purple side are characters from a 16h century Chinese novel, Fengshen Bang (the Investiture of the Gods). The banners are very large – they are triangular with the sides measuring between 4.4 metres and nearly 7 metres. 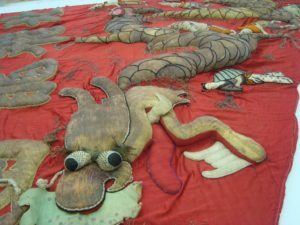 One has been disassembled during an earlier phase of treatment led by Julia Brennan of Caring for Textiles in Washington DC. 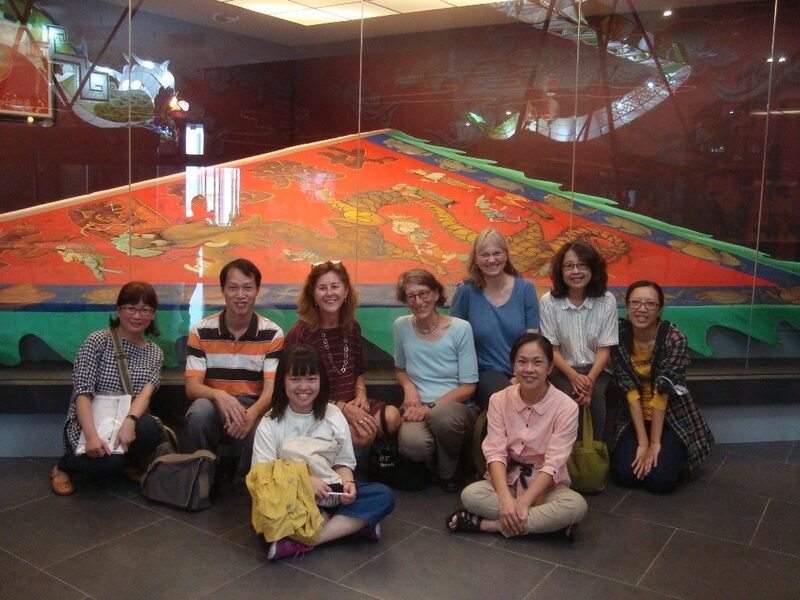 On this occasion, Julia Brennan, Deborah Trupin, of Trupin Conservation Services also in the USA, and I discussed the general conservation approach with staff of the Institute, led by Jui-Lien Fang, and Professor Fei-Wen Tsai of the Graduate Institute of Conservation of Cultural Relics and Museology at the Tainan National University of the Arts. The major challenge is how to mount one of the banners on a sloping board for display. 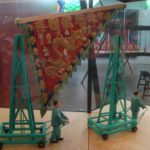 The embroidery is extremely three-dimensional – up to 9cm thick on each side of the banner – and the total weight of each banner is 31kg. One of the banners is to be displayed in a newly built cultural centre in Beigang in Yunlin County. It was really helpful to visit the centre to see the mount structure which has been built in a triangular display case. 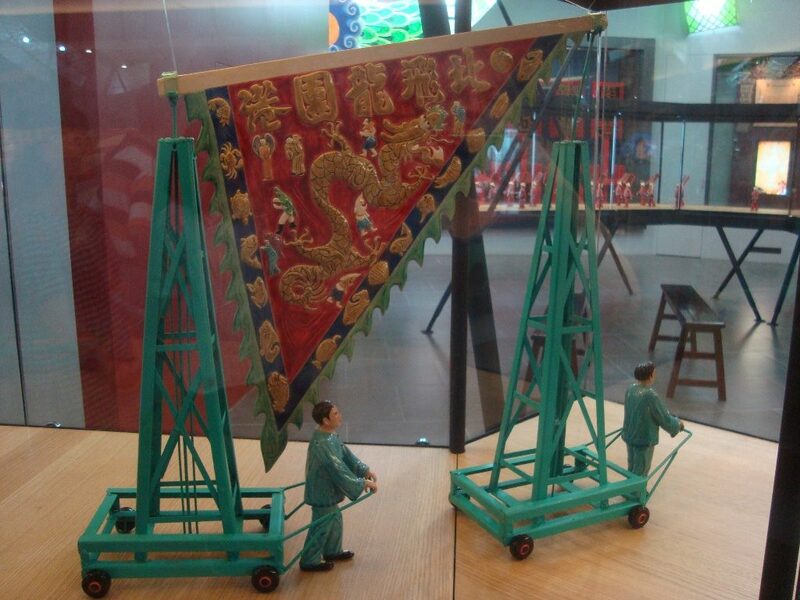 A painted reconstruction of a banner is currently on display there alongside a wonderful model of the procession which snakes through the gallery in a dragon-shaped file of display cases. 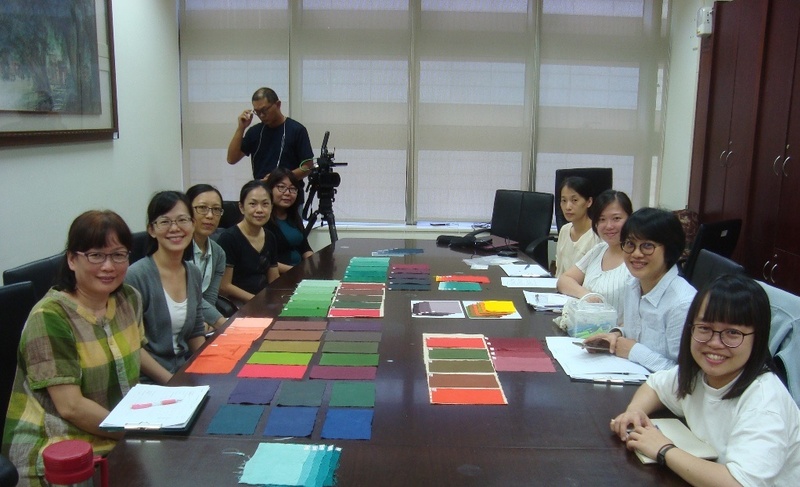 While I was in Tainan I also led a three-day dyeing workshop for staff of the Institute and other conservators in Taiwan. Each participant learned how to dye silk and cotton fabrics and took home a range of coloured samples, as well as a better understanding of the dyeing processes used to create conservation-quality dyed support fabrics. I’d like to thank all my colleagues, from Taiwan and the USA, for their generous hospitality and professional collaboration.